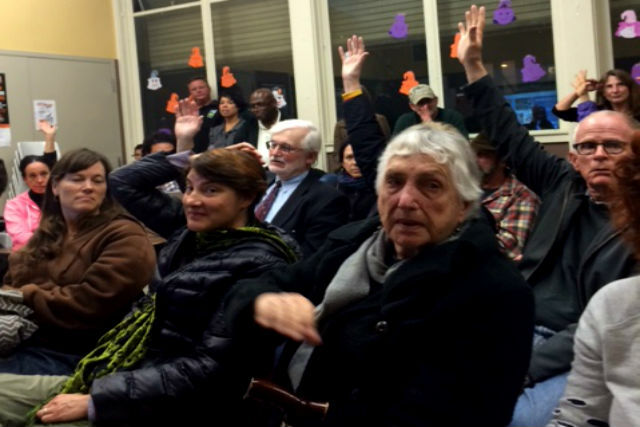 Suggested improvements to the Garfield swimming pool and clubhouse at 26th and Harrison streets were met with concern by Mission residents who packed a meeting Tuesday night aimed at gathering input about the redesign of a facility that has served the community for nearly 60 years. Designers said their vision for Garfield includes improving site lighting, acoustics in the pool, air quality, thermal comfort, and accessibility – currently, users must pass through the locker rooms to access the pool area. In questions from the audience, it also became clear that changing the length and depth of the pool is under consideration. “We heard that the pool is going to be shortened to 75 feet to accommodate high school swim teams and split into a 25-foot pool for children – is there any truth to this rumor?” asked Rebecca Sawyer, who was one of many swimmers attending the meeting at the Garfield Square Clubhouse to share their feelings about how the $11 million should be spent. The length of the actual pool currently spans 100 feet, and almost all participants – some of whom had to listen to the meeting from the hallway – wanted it to remain that length. James Wheeler, aquatic division manager for the San Francisco Recreation and Parks Department, said that changing the pool’s length and depth is under consideration, but he reassured attendees that no plans were set. Paulett Taggart and Alyosha Verzhbinsky represented the two design firms that will spearhead the project, and shared their initial design plans during the meeting. “Signage is a problem – you come in here and don’t know where to go,” she said. Verzhbinsky added that the pool’s uneven lighting, which leaves one side of the pool brighter than the other could be improved. Pool-users, some of whom have been swimming at Garfield for decades, urged the designers to address what they see as the pool’s more pressing issues including air quality. Mission resident Frank Brooks pointed out that the swim community at Garfield is a way of life, providing access to “physical, emotional, and spiritual” health for seniors. 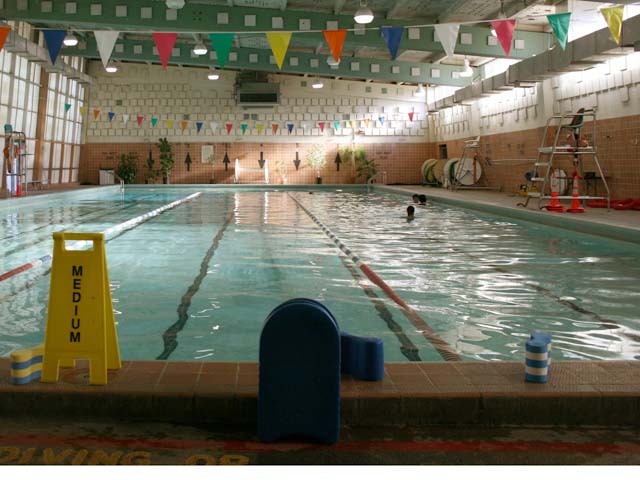 With an $11 million budget from three City bonds allocated towards improvements at the swim facility, leaders of the Garfield Pool Improvement Project presented a list of suggested modifications to the pool. “Part of the process that we want is to get as much engagement as we can,” said Project Manager Toks Ajike. His team plans to hold two more meetings in which residents will have a chance to weigh in on the conceptual design. Out of the total budget, roughly $8 million will be spent on the actual reconstruction of the pool facility, while the rest will cover management fees, permits and other pre- and post construction expenses. Ajike anticipates the construction phase will last 12-14 months, beginning as soon as the project plan is approved by the Planning Commission. “We hope to have the new pool open again in the fourth quarter of 2018,” he said. The pool is currently closed for annual maintenance, which is unrelated to the project. Almost all agreed that functionality and familiarity took precedence over beautification efforts. Before the meeting, Sawyer rallied a group of “senior swimmers” who compiled a list of their own suggestions, which she presented to the designers. Sawyer also suggested fixing a disabled door opener on the pool’s entrance, which she said has not worked in a long time. The group called for a hair dryer, a bathroom mirror, and a swimsuit spin dryer to be installed. Hand bar safety rails and shelves in the showers are also needed, said Sawyer, along with functioning lockers. Dana Desmione, who said he learned to swim at Garfield Pool as a child, believes that the changes suggested by the project’s management team are catering to a newer crowd in the Mission. If they want a pool for children, or that’s a shorter length, why not use the Mission Pool? Plus, it’s closer to Mission High.